Note: The instructions in (1) will not work with your TUmail account. They will work with a generic Gmail (Google Docs) account. 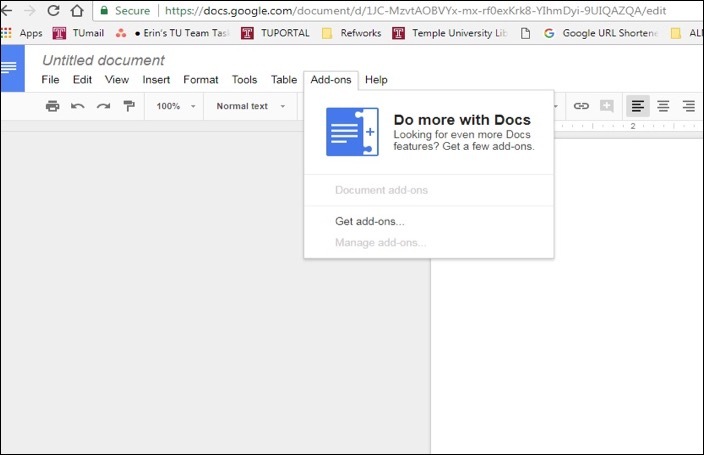 If you would like to use this Google Docs app in your TUmail, see (2). (1) Click on Tools and get the Google Docs Add-on for Proquest Refworks. (2) Open up a Google Doc. Click on menu item Add-ons, then Get Add-ons and search for Proquest Refworks and install.